This building stands on the site of 190 Shepherds Bush Road, home of George Bird and his family in the 19th century, as West London builders and brick makers they were responsible for many local buildings, including the earliest parts of Nazareth House and the Sacred Heart School, the stonework of the first Hammersmith Bridge (the present, second, bridge is built on the original Bird piers), and Holy Trinity Church on Brook Green. 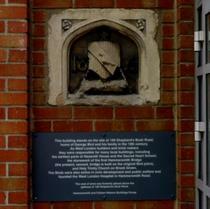 The Birds were also active in civic development and public welfare and founded the West London Hospital in Hammersmith Road, the coat of arms was formerly placed above the gateway of 190 Shepherds Bush Road. 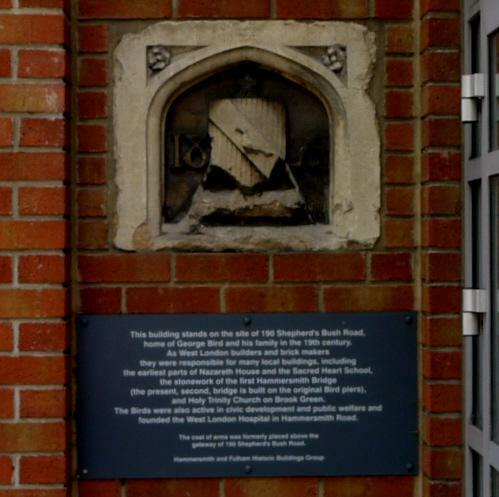 2019: The Hammersmith and Fulham Historic Buildings Group tell us that this plaque was installed in 2002/3 before they had established the standard HBG plaque design.